Jeremy Dyson wrote Rise of the Dead, admittedly inspired by his love for the zombie genre. 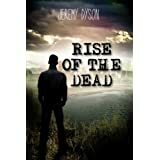 The dead do just as the title suggests, rise in typical apocalypse fashion due to unknown causes. What we do know is that they create other zombies by biting living humans, and the only way to kill the undead is a shot in the head. Sound familiar? While that might not sound particularly original, so what? Vampires sleep during the day, werewolves like a full moon, and ghosts are usually transparent. We have expectations, after all. I don’t mind the traditional conventional approach, which is why I picked up the book in the first place. The many TV series (Fear the Walking Dead, et al.) have certainly been thrilling over the last several years, and so I wanted to experience a novel approach (pun intended). Again, Dyson didn’t stray much from the norm, or much from an episode of The Walking Dead. That being said, Rise of the Dead is thrilling throughout its 250 pages, and the characters are interesting. I truly wanted to know what would happen to Blake (protagonist and probabilities expert) as he came to terms with his past and new relationships, living, dead, and undead alike, not knowing if his wife and daughter survived the onslaught. The other actors are complete, flawed in their own way, mostly surviving the challenges a zombie apocalypse poses outside of Chicago. In that way, the fantasy is believable and entertaining, albeit not particularly novel. Dead Heat is set to be released soon as a sequel of sorts, told from a different perspective, protagonist and place. I look forward to it.